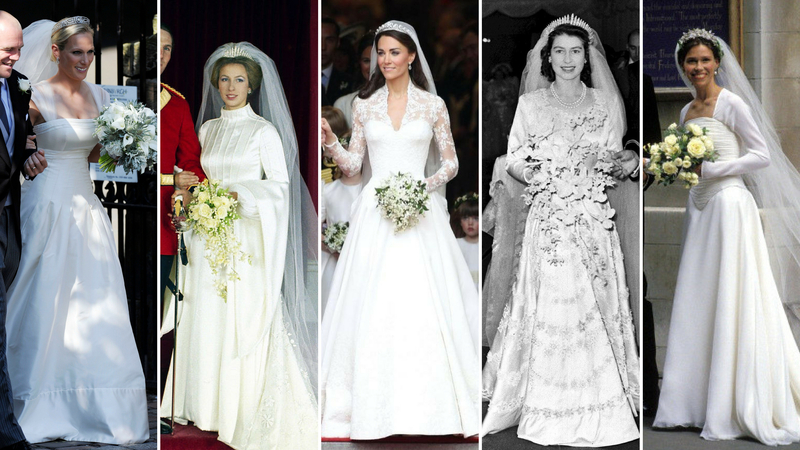 With the royal wedding coming this week, we thought we should take a look at past royal brides for inspiration for Meghan’s wedding dress, and also to admire some gorgeous gowns! Duchess satin, guipure lace, silk and tulle are all luxurious materials associated with beautiful haute couture wedding gowns. None are more spectacular or more couture than the fine craftsmanship that goes into the endless hours it takes to produce a royal bride’s wedding dress. Not only does the royal gown have to stand the test of time not leaning on trends or fashion, but the gown has to command a presence amongst the centuries-old colossal of the pale-stoned Westminster Abbey filled with history’s most notable national figures, or the high-vaulted ceilings of St George’s Chapel in the grounds of Windsor Castle. The royal bride should appear to be an ethereal figure, gliding down the aisle like a regal angel, stunning the congregation into a truly sensational ‘wow’ moment. Everyone struck with awe, mouths open at the fairytale Princess who makes everyone believe in true romance and love. A love that will last forever as all the bride’s dreams come true as she marries her Prince. But who has the ability to evoke such powerful emotive feelings with merely a dress? The Queen was Princess Elizabeth when she commissioned Sir Norman Hartnell to design her wedding gown for her marriage to Prince Philip in 1947. Norman Hartnell started his fashion house in 1923 in London and was renowned for wanting to design opulent yet elegant designs, he did not want to create anything that was too simple – in fact he despised it. He was considered an inspiration to Chanel and Dior. For Princess Elizabeth he wanted to create “the most beautiful dress I had so far made”. As he was designing the wedding gown of a future Monarch of Britain this would only be fitting. The dress was meant to have a message for the nation of rebirth and regeneration after the hard years of the war. The soft ivory damascus prokar creation that Elizabeth wore is decorated with crystals and 10,000 seed pearls sourced from the USA; the embellished details of the gown are exquisitely beautiful when viewed close up. The gown also incorporates a 13- foot-long floral patterned train, which was inspired by Botticelli’s Primavera. Here Hartnell took his inspiration from the painting and incorporated ears of wheat, white-roses, lilac, jasmine and smilax flowers embroidered in silver and gold thread. Princess Elizabeth wore Queen Mary’s fringe tiara to secure her veil in place. There was slight hiccup with the tiara actually snapping just before the ceremony and having to be hastily fixed, leaving a slightly noticeable gap. This tiara became one of The Queen’s favourites and she often wears it still. The Princess’ gown was far from plain with the skirt heavily embroidered with floral and leaf motifs in spiralling concentric circles over the full skirt. Princess Alexandra of Denmark has similar concentric circle embroidery over her wedding gown skirt but not as many revolutions as Elizabeth’s. The high pointed neckline of the gown is heavily embellished with floral and leaf motifs. Padded shoulders create a puffed sleeve that tapers down the arm into a point, with the cuffs of the sleeves also featuring the beautiful beaded embellished flowers and leafs. The fitted bodice of the dress shows the popular trends of 1940’s dress styles. Elizabeth wore shoes designed by Edward Rayne. It took Hartnell’s team of 250 women, three months to create the gown. He was also responsible for designing Queen Elizabeth’s coronation gown. We think Princess Elizabeth looked exquisitely stunning in her wedding gown and her veil is one of the most highly decorated royal wedding veils to date. Unfortunately due to the years of time and ageing, The Queen’s wedding gown has long since yellowed in it’ colour and the ivory lustre of the silk has been lost, which is quite unfortunate. Did you know? Hartnell sourced his silk from China instead of Japan, as Japan had been an enemy to the British during WWII, just a short two years previous. Fact: Princess Elizabeth incorporated sprig’s of Myrtle into her wedding bouquet that were grown from the same Myrtle as used in Queen Victoria’s bouquet. Kate Middleton married Prince William on 29th April 2011 and commissioned Sarah Burton – the newly appointed Creative Designer of British fashion house Alexander McQueen – to design her gown. This was considered quite a bold move to choose Alexander McQueen as the British designer was synonymous with skulls, studs, spikes and punk-style garb. His personal struggles seem to echo through the dark clothing. Hardly the designer for a future Queen Consort and Kate didn’t seem quite the Fashion Couture girl she is today to choose such an edgy design house. Would the soon to be Duchess of Cambridge walk down the aisle in a skull embroidered gown, with spiked shoulders and armadillo heels? Nevertheless, as the press do best there was much speculation that the secret was out and McQueen was set to be Kate’s wedding gown designer. Kate’s wedding gown was the most anticipated royal wedding gown for a decade and she didn’t disappoint. When Kate stepped out of the Rolls Royce, her wedding gown showed instant parallels with Grace Kelly’s when she married Prince Rainer of Monaco, with the long lace sleeves and fitted bodice. Kate had a true “wow” moment as she stood very composed outside the Abbey fixing her dress and veil and we all able to get a very good look at her amazing gown as her sister Pippa picked up her nine0foot train. Her silk tulle lace trimmed veil was one of the shortest in royal history, falling to just below the waist and not the full length or longer than the train, it was held in place by the Cartier Halo tiara, on loan from The Queen. The gown was made from both white and ivory satin gazar, a nice choice of fabric as it holds it’s shape well. The lace used in Catherine’s dress used traditional lace making techniques to echo late 17th century lace of Limerick and Carrickmacross laces of Ireland and was hand crafted at the Royal School of Needlework, with tulle sourced from Sophie Hallette Lace as well as Solstiss (both French) and the Cluny Lace Company of Derbyshire. The lace featured intricate floral designs of lilies, daffodils, thistles, shamrocks and roses. The lacemakers had to wear gloves to avoid getting the lace dirty or oily and changed needles every 30 minutes to ensure the needles were sharp when making the lace thus providing the highest quality of lace for the Royal Bride. The fitted bodice with sweetheart neckline featured the lace appliqué and was also present in peaked “V’s” around the hem of her skirt, which were not very clear on television, but are noticeable in HQ photos from the day. The gown features a high scalloped neckline that came down in a sharp pointed V-slash to the top of the bust line. The lace appliqué carefully crafted onto the bodice spilled ever so slightly over the onto the first few centimetres of the panelled pleated full skirt. The skirt of the gown is to look like an opening flower and the under of the skirt featured many layers of tulle. Catherine worked closely with Sarah to design the dress to combine a vision of modernity combined with tradition. Inspired by Victorian styles shown in Kate’s gown through the corseted bodice, skirt featuring a bustle with folded layers of material and 58 rouleau loop button, this dress had a truly old-world and romantic feel. The buttons were actually our favourite feature of Kate’s gown. The skirt was able to have more of a flare and accentuate Kate’s tiny waist as Burton added padding to the hips. Burton also sewed a blue ribbon to the inside of Kate’s gown to fulfil the ‘something blue’ part of the day. The day dress went on display at Buckingham Palace in the summer of 2011, giving us fantastic access to close up views of the dress. The Alexander McQueen Fall 2011 Ready To Wear Collection, shown 7 weeks prior to Kate’s wedding. Fact: On 7th March 2011 Sarah Burton held the Alexander McQueen 2011 Fashion Show. This collection featured a medieval/dystopian theme with many fashion and avant guard style dresses that could be considered Wedding Dresses. Perhaps Sarah was funnelling all of her inspirations for Kate’s dress that she was unable to use. After receiving an email in our inbox alerting to view this collection, it was our first sure fire evidence that McQueen was the designer. And then on the evening, Kate wore another Sarah Burton design. This time she chose a very simple ivory satin strapless gown embellished at the waistline with a crystal encrusted belt and a full circle skirt. The fitted bodice with sweetheart neckline seemed to be identically constructed to her previous gown. Kate wore a white angora bolero cardigan over her shoulders. The strapless silhouette is definitely not our favourite choice for Kate and seems much more everyday bride than a royal one. In fact all brides should never wear a strapless wedding dress, as you spend the whole time, pulling it up, tugging at it and fiddling with it to ensure it stays and place and does not fall down to preserve your modesty. A wedding gown should always be elegant and classy, and a strapless gown rarely evokes this feeling. However, Kate still looked stunning in this dress, though we would’ve preferred something a little different. You can buy a very affordable replikate of Kate’s evening reception gown here. Over the years the Duchess has worn countless McQueen pieces with only one of these featuring two jacquard skulls on her ice blue jacket as she rode up the Mall in a carriage for Trooping the Colour. Kate has the skulls removed from her clutches and replaced with gemstones. The lack of any distinguishing signature McQueen features on Kate’s clothes and clutches almost lean toward saying that Kate simply employs Sarah Burton as a seamstress to create bespoke clothes as Angela Kelly does for The Queen. The majority of Kate’s pieces are not essentially Alexander McQueen designs, but very paired back and plain clothing, though as a Princess, Kate can hardly walk around with skulls over her ensembles. Therefore, you will read many articles from the time saying Kate’s Wedding Gown was designed by Sarah Burton for Alexander McQueen. After many a tumultuous relationship, Princess Margaret – The Queen’s sister – finally found love with and married Antony Armstrong-Jones on 6th May 1960 at Westminster Abbey. She also had her wedding dress designed and made by Sir Norman Hartnell. Princess Margaret is akin to what Prince Harry is now, the sibling to the heir to the throne and therefore not as many restrictions are placed upon them, as they not the future Sovereign getting married. Princess Margaret was quite a free spirit and loved fashion, she was a very smart, elegant dresser, a very beautiful dresser – one could say a lot less traditional than her sister. Princess Margaret’s Christian Dior gown she wore in a 1955 portrait has become one of her most iconic looks and could almost have been used as her wedding gown. So it seems strange she had such a simple and unfussy design for her wedding gown. The gown is still majestic and beautiful but features none of the fussy embroidery, embellishments, jacquard, lace or beaded work of other royal gowns. Hartnell created the gown from silk organza and the skirt was made from 30 metres of fabric. Whilst Hartnell had shunned simplicity in most of his designs, Margaret’s gown was aplomb in simplistic design, though the craftsmanship and tailoring of this dress is second to none, allowing for a truly stunning gown. You will notice the same style of fitted bodice with sweetheart neckline that appears on Kate’s wedding dress. The bodice is overlaid with sheer organza, a high neck into a v-shape and long sleeves. The stunningly long veil is trimmed in the same silk organza. The skirt of the gown is incredibly voluminous featuring layers and layers of tulle underskirt, very characteristic of the 1950’s and classic Dior dress designs. Even with all the layers of skirting the gown does not swamp the petite bride, though enhances and radiates her natural regal beauty. Princess Margaret wore the Poltimore Tiara, a very beautiful tiara that is almost large enough to be a crown. Rumoured to have been purchased by the Princess in an Sotheby’s Auction from it’s originally owner Lady Politmore, this tiara was made by Garrard. Diana Spencer captured the heart of Prince Charles and they married in 1981 at St Paul’s Cathedral. Diana choose the husband and wife duo of David and Elizabeth Emmanuel, who were relatively unknown at the time and had little experience in making wedding gowns, they had only been in business since 1977. The Emmanuel’s were known to the public to be creating Diana’s dress before, the day, though to guard her privacy they installed a safe and shutter to keep everything a secret, and would leave “fake rubbish” in bins around their premise to throw off the press. Many have commented that Diana’s dress was very 80’s and looks dated. However, the 80’s had barely started or launched it’s fashion mark at the time of her wedding, in fact Diana’s dress borrows more design features from Victorian fashion. The Emmanuel’s were fortunate that they did not have to follow any traditional protocols as set out by the Palace, so had more freedom to create a style unique for Diana. After having Diana fit every different shape of dress, she settled on a silhouette she liked and the Emmanuel’s set out sketching over 50 variations of this silhouette for her. They researched royal brides of history to provide further inspiration to their design. Their focus was on a boned bodice to highlight Diana’s slight frame, a very full skirt to compete with the scale of St Paul’s and to incorporate Antique Lace which was inspired by Queen Victoria’s wedding gown, who also had antique lace incorporated into her dress. This is quite intriguing to think that in 1840 Victoria had used antique lace, how old this antique lace must be today? The stand out feature of Diana’s wedding gown was her exceptionally long train measuring 25 feet – the longest ever royal train, with the previous longest train being only 23 feet. An even longer veil was attached and held in place by the Spencer family tiara; the veil used 153 yards of tulle and was edged in lace. Together the veil and train stretched what seemed almost halfway down the aisle at the Cathedral and seemed to float endlessly all the way down the stairs as Charles and Diana left the Cathedral. Diana’s gown was made from ivory silk taffeta and features a v-neck line attached with a consort of large ruffles and a bow in the centre. There were also oversized puff sleeves, that are cinched at the elbow with a bow and layers of delicate antique lace extruding from these sleeves. The lace dates back to Queen Mary of Teck, a square of Carrickmacross lace came from the Royal School of Needlework. The lace was embellished with sequins and strings of 10,000 pearls. The taffeta fabric of Diana’s dress was specially spun at a British Silk farm Stephen Waters in Nottingham. A small blue bow was sewn into the pearl embellished waistband as the ‘something blue’. Five different boned bodices were constructed for Diana’s dress as she lost weight as all brides do over the months to her wedding. She was sewn into the fitted bodice, which also features antique lace down the centre panel. Numerous layers of tulle petticoat were added to create a very voluminous full skirt which shows a crimped scalloped hem. As so much material was used for Diana’s dress the taffeta became very crushed in the carriage ride to the Cathedral and upon exiting the carriage her dress almost looked a frightful mess! Luckily the designers were on hand with hair-dryers for just this situation and used the heat to quickly try and iron out some of these creases. The Emmuanels sewed into the label of the dress an 18CT gold horseshoe trinket with white diamonds. Diana’s dress is beautiful and stunning, a true fairytale dress. There may be parts that are oversized and appear overdone, but they needed to be for the backdrop of the Cathedral and the halls of Buckingham Palace. The veil, the train and the puff sleeves are all what have gone into making Diana’s dress iconic and copied by countless brides. They are not ostentatious or gaudy, but carefully researched and constructed pieces of old-world couture to evoke Kings and Queens of the Victorian era. Lady Sarah Armstrong-Jones is Princess Margaret’s daughter and is said to be the Queen’s favourite niece. She married David Chatto on 14th July 1994 at St. Stephen Walbrook, London. Sarah wore a design by wore Jasper Conran and this one of our favourite royal wedding dresses. Conran studied at Parson’s School of Design in New York, was one of the founding members of London Design Collections, what we now know as London Fashion week ;he was awarded an OBE in 2008. Lady Sarah’s dress takes it’s inspiration heavily from 16th century Medieval and Tudor English fashion and Italian renaissance fashion. This can be seen in the fitted ruched pointed bodice with square neckline, worn over the top of a separate piece of longer sleeves and a full skirt. Even her rounded Snowdon floral tiara and the way her veil falls from this looks very similar to a french hood which was a favourite of women of the Henry VIII’s court. Sarah’s dress was made from draped layers of georgette fabric and a three-metre train. Lady Sarah’s wedding gown is incredibly simple but impeccably constructed and tailored giving the bride a regal glow. Her cinched bodice showed off her beautiful hour glass figure and the simple draped skirt fell perfectly to the floor, over many layers of underskirt to give a beautiful symmetrical full look. The light veil flowed beautifully behind her, attached with her mother’s tiara. The bridesmaids wore almost identical dresses to her. The silhouette of the bridesmaids’ dresses was the same, a fitted bodice, long sleeves and full skirt. However, their bodice and sleeves was an all in one corseted piece with vertical ribbing, giving the feeling of an under garment worn in Tudor times. Lady Sarah Chatto’s dress is elegantly beautifully and we feel quite overlooked amongst royal wedding gowns. Sophie Rhys-Jones married Prince Edward on 19th June 1999, at St George’s Chapel, Windsor Castle. Sophie chose designer Samantha Shaw. Sophie’s dress was designed to be medieval to fit with Prince Edward’s desired wedding theme. The gown was actually a coat dress and was made from hand dyed silk organza and silk crepe. Sophie’s long veil is a mere one inch longer than her train, featuring crystal detail embellishments and was held in place by what is an unknown tiara, was stated to be from The Queen’s private collection and possibly made up from pieces of Queen Victoria’s jewellery. Sophie’s gown, another simple-looking dress, was actually comprised of two parts: a silk under dress, topped by a coat dress with a long train. The Shaw designed gown was scattered with over 325,000 cut-glass and pearl beads to glitter and sparkle when caught in the sunlight. The dress features a very prominent v-neckline edge in a wide pin tucked band that falls down the centre of the bust line. Three diagonal darts appear under the bust line of the gown. Long billowing fluted sleeves evoke a true Medieval Princess gown. The gradual flared skirt of the dress features a thin contrast hemline band. The amazing details of this Royal Wedding Gown are also lost as similar to Princess Anne’s, due to the quality of the photos available from the day, which is such a pity. You can see the second sleeve below – or click the tweet above for another angle. Prince Edward had some jewellery commissioned for Sophie made by Asprey & Garrard. A gothic style white and black pearl necklace in the form of a cross, and white and black pearl drop earrings. Princess Anne, The Queen’s only daughter, married Captain Mark Phillips on 14th November 1973 (Prince Charles’ birthday! ), at Westminster Abbey. Her wedding gown was designed by Maureen Baker who was chief designer at Susan Small; Baker had dressed the Princess many times in the past and would continue to design dresses for Anne into the future, which she continues to wear on frequent rotation even now. Princess Anne designed many features of the gown herself and this royal wedding dress seems to be the only one that truly hails from an era – meaning it looks very 1970’s. However, if you look a bit closer Princess Anne’s dress has similarities to a mix of late Anglo-Saxon designs and Tudor fashion. Baker was actually inspired by dresses from the royal court of Elizabeth I. You may notice that Princess Anne’s gown actually looks to have two different sleeves and believe it or not, it does! A chiffon fitted sleeve ending in a puffed pleated cuff (bishop sleeve) with a long oversized draping sleeve (angel sleeve) – no these aren’t elf sleeves from Lord of the Rings, that movie was made many years later. The oversize sleeves swept down past her knees in length and were edged in pearls. In Anglo-Saxon times, a regal gown was comprised of many pieces including an under part with fitted sleeves called a ‘kirtle’ and over the top with long draping sleeves the ‘gunna’ was worn. Similar gown styles appear up to and into the 16th century. Princess Anne’s dress was also a very simple design and quite opposite to the heavy embroidered beading that featured prominently over her mother’s. The stand out features of Anne’s dress was her high neckline, which we think has not been seen on any other British Rroyal bride before or after Anne. As well as the pin tucked panelled bodice. Though it does features strings of pearls sewn over the bodice and floral embroidery over the train which was created by Lock’s embroiderers. It seems that Anne’s gown may have had pearls around the neckline and down over the shoulder but the images from Anne’s wedding lack in clear detail to show what could be some exquisite features. Click the tweet below to see more close-up details. Anne’s gown featured a flowing seven foot train and and light veil worn with Queen Mary’s fringe tiara, her great-great grandmother. This is the same that Princess Elizabeth wore in 1947. 15 women worked on separate parts of the gown and did not know what the final product was to look line; this was done to ensure the design of the gown was kept hidden. This gown is a very unique and stand out piece amongst wedding gown designs, we hope one day that this dress will go on display at Buckingham Palace or a Museum so the details can be finally seen. For her second wedding to Sir Tim, Anne wore a very simple short dress for the ceremony in Scotland on 12th December 1992. It had long (but not flared!) sleeves, a pencil fit design, and another high-neckline, with fold detail. Quite the difference! Sarah Ferguson married The Queen’s second son, Prince Andrew, on 23rd July 1986 at Westminster Abbey. The designer for Sarah’s dress was Lindka Cierach. Sarah’s dress was made from ivory duchess satin, featuring a rounded neckline, padded shoulders – as was the norm of the 80’s – 3/4 sleeves and fitted embroidered bodice. The stand out feature of Sarah’s gown was the letter “A” that she had embroidered into the train of her gown for “Andrew.” Sarah had other motives embroidered into her train including a heart for romance, an anchor and waves to signifying Andrew’s naval career, a bumblebee and thistles that were part of her family’s Coat of Arms. What some may consider to be a little tackywas in essence a beautiful romantic gesture of a young woman who was madly in love with her Prince. Sarah’s gown was constructed from a boned pointed bodice, accentuating a very nipped in waistline. Flowing down from the bodice an oversize flared a-line satin skirt with many layers of tulle petticoat. The low scooped neckline showed a heavily beaded and embroidered bodice and beaded sleeve cuffs in silver thread. The padded shoulders feature jewel encrusted bows. The long train was 17-feet in length and attached with an oversize satin bow. Unfortunaltey, it seems the skirt of Sarah’s gown became crushed as Diana’s had from sitting in the carriage on the way to the Abbey. A lace trimmed veil was fixed by a floral wreath, which was removed after the wedding to reveal Sarah wearing the York Tiara underneath, signifying her transition from commoner to Royal. The tiara was purchased for her by The Queen from Garrard, a very beautiful wedding gift. Sarah’s wedding gown did become quite popular and as with every past and present royal gown was copied by brides the world over. Autumn, a Canadian native, started dating Peter Philips in the mid-2000s. She had no idea who he was until she was watching TV with her mother and saw something about the Royal family. The couple married on 7th May 2008, at St George’s Chapel at Windsor Castle. Autumn chose a wedding gown by UK bridal wear designer Sassi Holford. Sassi was a relatively unknown designer, who was recommended to Autumn by some friends. She was self-taught with her wedding dress designs stocked in Harrods and Liberty of London, but her business soon expanded into Europe and New York. Autumn and Sassi worked closely on the design together. Autumn wanted her gown to be romantic, understated and classic and Sassi’s lasting inspiration for all her wedding gowns is attributed to the demure style of Princess Grace. The dress’ voluminous a-line skirt was made from Italian duchesse silk and French Chantilly lace, which can be seen in the delicate lace cap sleeved bolero and sculptured bodice. The stand out feature was the wide silk sash around the bodice cinching in the waist, very Grace Kelly. Sassi – in keeping with Autumn’s wishes – kept the front design minimal and regal to give a sophisticated polish to the gown. She added a twist and a little fun to the rear design in series of large bows, which were sewn onto the back of Autumns gown, in a vertical gathered lines of skirt fabric. The rear of the bodice was finished with rouleau loop button closures. Sassi sewed blue bows to the inside of Autumns dress for her ‘something blue’. Autumn wore a silk veil that was hand embroidered, beaded, edged in Chantilly lace and topped with the Festoon Tiara, borrowed from her mother-in-law, Princess Anne. The daughter of Princess Anne, The Princess Royal, Zara married rugby player Mike Tindall at a low key ceremony on 30th July 2011 at Canongate Kirk church in Edinburgh, only a few months after her cousin Prince William’s wedding to Kate Middleton. The bride chose an ivory coloured Stewart Parvin design, which was made from silk faille and silk duchess satin. An almost-strapless style dress with added tulle cap sleeves, these sheer tulle sleeves almost seem like an after-thought that were quickly tacked on, though we highly doubt they were. If we are permitted to draw on Disney Princess references, you will see Princess Anna wearing a dress in this type of strapless construction with added tulle cap sleeves. The gown features a diagonally-seamed fitted bodice with empire waistline. The bust line and waistline feature horizontal layers of raw edge satin and the skirt falls away from the bodice in pleats, to a full voluminous full skirt. The skirt has quite an unusual feature of a large contrasting hemline. This hemline seems a little out of place. It almost appears as though someone is trying to add length to the dress? Could Zara’s dress have meant to be shorter? Perhaps an asymmetrical hemline that was changed late into the design? Zara’s simple silk tulle veil was long and beautifully flowed behind her, affixed with the Greek inspired design Meander Tiara, that Zara borrowed from her mother Princess Anne. This is probably not our preferred choice of gown for Zara, a longer sleeve would have been nicer, though the weather probably would not have permitted this. Get an affordable replicate of Zara’s dress here. Camilla Parker Bowles married Prince Charles on 9th April 2005, in a civil ceremony at Windsor Guidhall. The designer for Camilla’s wedding was Robinson Valentine, though the label is now known as Anna Valentine. Camilla wore two dresses for her wedding to Prince Charles, both coat dress styles, with the first quite a bit simpler than the second. Camilla did not choose to wear a traditional wedding gown for her wedding to Prince Charles, this may be due to the fact it was the second marriage for both. Camilla’s first ensemble was a matching knee length cream dress and coat. The chiffon dress featured a rounded neckline with varying sized applique discs that were also present in the hemline in graduated sized vertical disc panels. The dress was topped with a silk boucle tweed coat and had The Prince Of Wales feather brooch pinned to the lapel. Camilla chose a large hat by her now-favourite milliner Philip Treacy. The oversize brim cream hat featured lace appliqué on the crown, a large flower, several spiked quills and feather details. Later, Camilla change and wore an ice blue satin gown with matching coat dress over the top for the religious blessing at St George’s Chapel. The floor length gown was made from chiffon and was a simple, understated and unembellished design. The damask coat over the gown featured intricate gold leaf patterns throughout. The stand out feature of this gown was the embellished gold embroidery adorning the neckline, that was inspired by a piece of Camilla’s mother’s jewellery. Camilla opted to wear a large gold feathered headpiece that was tipped with Swarovski diamonds, also by milliner Philip Treacy to compliment her gown, rather than a tiara. We think all the brides look stunning in their own right. We are still quite stunned at just how embellished The Queen’s wedding gown and veil is, and this without doubt our favourite gown from our post. So with Meghan and Harry’s wedding just days away; which designer and style are we going to be discussing for decades to come? Will it be the much-anticipated Ralph and Russo, whose haute couture gowns have high-reaching price tags? Perhaps Meghan will surprise us all with an unknown. One thing is certain, it should be a British designer, we think. And if Meghan’s wedding dress doesn’t quite curb your fashion royal fashion excitement, come October we can all swoon over Princess Eugenie’s gown and hopeful tiara moment! Tell us in the comments which royal wedding gown is your favourite or if we have missed your dream gown.